One of the things that makes Summits on the Air, or SOTA, possible is the background work that's been done by volunteers around the world. 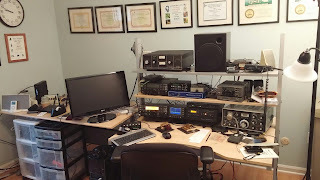 Summits on the Air organizationis based out of the United Kingdom and has a very robust series of web sites that tell the operator anything they need to know, keep track of logs and standings and offer a glimpse into the world of SOTA. SOTA has recently updated its mapping software, and I'm going to use a couple of maps, courtesy of SOTA, to answer the two most common questions I hear -- "Where are the summits," and "How far can you talk." First the reach. While I've reached Europe a few times from summits, on most activations I can work stations from coast to coast. 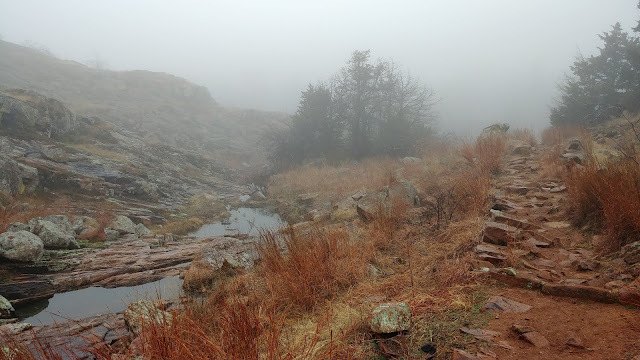 The map below shows the stations I worked on November 18 from Petit Jean Mountain. The red dots are home stations or chasers. There are three colored triangles on this map. One indicates my summit, and the other two are other activators I worked. That's referred to as a summit-to-summit contact, and I generally make between to and four on most activations. The second map shows the summits I've activated in the last year and a half. Most are in Arkansas, a few in Oklahoma and three in South Dakota. My plan is to make some trips this spring and summer to add a bunch of states to that list -- North Carolina, Tennessee, New Mexico, Arizona, Wyoming, Colorado. The third map shows detail of the summits in Arkansas and east Oklahoma.